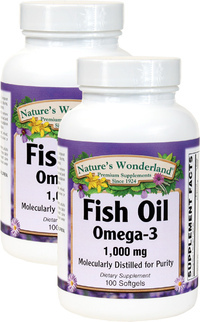 Fish Oil Omega-3 1000 mg, 100 Softgels each (Nature's Wonderland) - Penn Herb Co. Ltd. Essential fatty acids cannot be manufactured by the body and must therefore be supplied through the diet. These extraordinary nutritional oils support memory, heart health, joint mobility, skin health, and more! 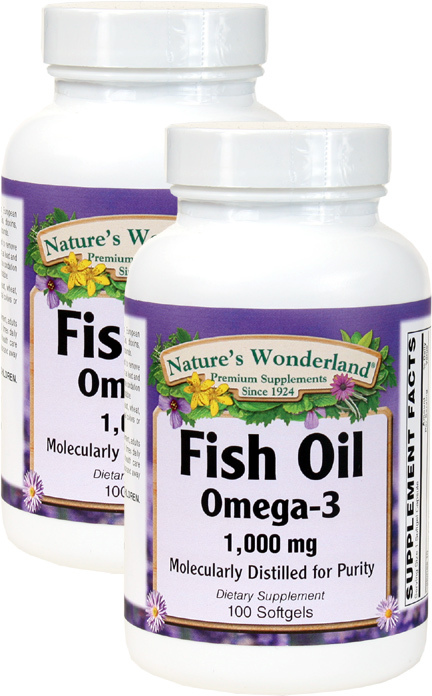 Our Fish Oil concentrate supplies an impressive 180 mg EPA and 120 mg DHA per serving! EPA…supports heart & cholesterol wellness. DHA…important brain nutrient, supports mood and memory . Supportive but not conclusive research shows that consumption of EPA & DHA omega-3 fatty acids may reduce the risk of coronary heart disease. Supports joint comfort & flexibility; promotes healthy brain and mental function; maintains healthy skin; nourishes & moisturizes dull, brittle hair and dry skin; promotes healthy mood. As a dietary supplement, adults take 1 softgel two times daily with meals, or as directed by a healthcare professional.